Cold and Flu Season? Try to steer clear and stay healthy! Cold and flu season can be extremely rough. Fortunately, there are several common-sense ways to help avoid getting sick. Frequently wash your hands with soap and water for 10 seconds. Use hand sanitizers throughout the day to keep bacteria off your hands and prevent the spread of germs. Disinfect your home with a mild solution of 2 – 5% bleach in water to kill viruses and bacteria. Eat a well-balanced diet to help build a healthy immune system. Get plenty of rest, giving your body the time it needs to repair itself. If you’re feeling sick, do what you can to help prevent spreading the viruses and bacteria. Your friends, family, and co-workers will thank you. 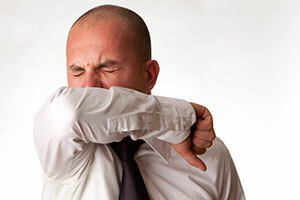 Cover your nose and mouth with a tissue when you cough or sneeze, or cough and sneeze into your elbow. Dispose of tissues in a no-touch waste receptacle. If you’re sick with flu-like symptoms, the Centers for Disease Control and Prevention (CDC) recommends that you stay home for at least 24-hours after your fever is gone. Just by taking a few simple precautions, you can do your best to avoid becoming a victim of the cold and flu season.